The finding, published Feb. 23, 2017 in the journal Nature, is important because it provides the first hard proof for what scientists call the "chaotic solar system," a theory proposed in 1989 to account for small variations in the present conditions of the solar system. The variations, playing out over many millions of years, produce big changes in our planet's climate -- changes that can be reflected in the rocks that record Earth's history. 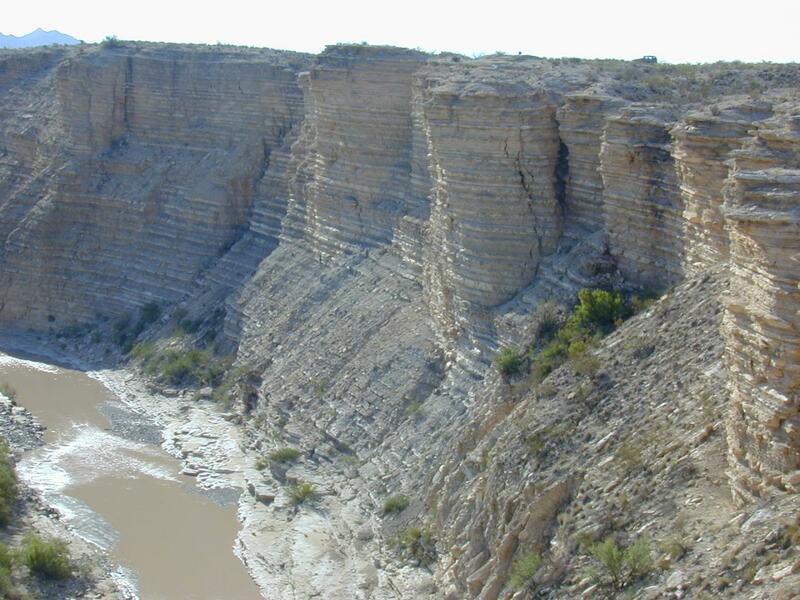 The layer cake of sedimentary rock near Big Bend, Texas, shows the alternating layers of shale and limestone characteristic of the rock laid down at the bottom of a shallow ocean during the late Cretaceous period. The rock holds the 87 million-year-old signature of a 'resonance transition' in the orbits of Mars and Earth, definitive geologic evidence that the orbits of the planets in our solar system behave differently than prevailing theory, which held that the planets orbit like clockwork in a quasiperiodic manner. Using evidence from alternating layers of limestone and shale laid down over millions of years in a shallow North American seaway at the time dinosaurs held sway on Earth, the team led by UW-Madison Professor of Geoscience Stephen Meyers and Northwestern University Professor of Earth and Planetary Sciences Brad Sageman discovered the 87 million-year-old signature of a "resonance transition" between Mars and Earth. A resonance transition is the consequence of the "butterfly effect" in chaos theory. It plays on the idea that small changes in the initial conditions of a nonlinear system can have large effects over time. In the context of the solar system, the phenomenon occurs when two orbiting bodies periodically tug at one another, as occurs when a planet in its track around the sun passes in relative proximity to another planet in its own orbit. These small but regular ticks in a planet's orbit can exert big changes on the location and orientation of a planet on its axis relative to the sun and, accordingly, change the amount of solar radiation a planet receives over a given area. Where and how much solar radiation a planet gets is a key driver of climate. "The impact of astronomical cycles on climate can be quite large," explains Meyers, noting as an example the pacing of the Earth's ice ages, which have been reliably matched to periodic changes in the shape of Earth's orbit, and the tilt of our planet on its axis. "Astronomical theory permits a very detailed evaluation of past climate events that may provide an analog for future climate." "The Niobrara Formation exhibits pronounced rhythmic rock layering due to changes in the relative abundance of clay and calcium carbonate," notes Meyers, an authority on astrochronology, which utilizes astronomical cycles to measure geologic time. "The source of the clay (laid down as shale) is from weathering of the land surface and the influx of clay to the seaway via rivers. The source of the calcium carbonate (limestone) is the shells of organisms, mostly microscopic, that lived in the water column." Meyers explains that while the link between climate change and sedimentation can be complex, the basic idea is simple: "Climate change influences the relative delivery of clay versus calcium carbonate, recording the astronomical signal in the process. For example, imagine a very warm and wet climate state that pumps clay into the seaway via rivers, producing a clay-rich rock or shale, alternating with a drier and cooler climate state which pumps less clay into the seaway and produces a calcium carbonate-rich rock or limestone." The new study was supported by grants from the National Science Foundation. It builds on a meticulous stratigraphic record and important astrochronologic studies of the Niobrara Formation, the latter conducted in the dissertation work of Robert Locklair, a former student of Sageman's at Northwestern. The motions of the planets around the sun has been a subject of deep scientific interest since the advent of the heliocentric theory -- the idea that the Earth and planets revolve around the sun -- in the 16th century. From the 18th century, the dominant view of the solar system was that the planets orbited the sun like clockwork, having quasiperiodic and highly predictable orbits. In 1988, however, numerical calculations of the outer planets showed Pluto's orbit to be "chaotic" and the idea of a chaotic solar system was proposed in 1989 by astronomer Jacques Laskar, now at the Paris Observatory. Following Laskar's proposal of a chaotic solar system, scientists have been looking in earnest for definitive evidence that would support the idea, says Meyers. "Other studies have suggested the presence of chaos based on geologic data," says Meyers. "But this is the first unambiguous evidence, made possible by the availability of high-quality, radioisotopic dates and the strong astronomical signal preserved in the rocks."